F-80037 Amiens Cedex 1, France. I obtained my Ph.D. in February 1993 in Organic synthesis (@ the "Laboratoire de Biochimie Structurale", Université d'Orsay-Paris XI, Orléans, France; Prof. J.-M. Beau and Dr. J. Prandi). During my thesis, I studied how asymetric synthesis methods are efficient to synthesize unusual thiosugars, components of enediyne antibiotics. Then, I did two post-docs: During the first one (@ the "Biomembrane Institute", University of Washington, Seattle, WA, USA; Prof. S.-i. Hakomori and Dr T. Toyokuni), I studied the electrophilic azidation as a new source of 2-aminosugars. I also worked on the development of glycopeptide vaccines useful against breast cancer, and on 2D-NMR structural studies of glycopeptides. During the second one (@ the "Laboratoire de Synthèse de Biomolécules", Université d'Orsay-Paris XI, Orsay, France; Prof. J.-M. Beau), I was involved in the development of a new method relevant to reduce complex azido-oligosaccharides, based on Samarium diiodide. In October 1996, I got a position of Assistant Professor or "Maître de Conférences" (@ the UFR de Pharmacie, Université de Picardie Jules Verne, Amiens; Prof. J.-P. Monti, and then Prof. J. Rochette), and I worked on the synthesis and structural studies of proteins and/or oligopeptides. From September 2003 up to September 2005, I worked as "Research Associate" (@ The Scripps Research Institute, Dpt. of Molecular Biology, La Jolla, CA, USA; Prof. D. A. Case). I was involved in the study of electrostatic interactions in proteins and nucleic acids. Since September 2006, I am Professor of Organic chemistry (@ the UFR de Pharmacie, Université de Picardie Jules Verne), and I am interested in bioinformatics as well as empirical force field development, atomic charge derivation and molecular dynamics studies of non-natural oligosaccharides, oligonucleotides and polypeptides. - RESP ESP charge Derive (presently belongs to the R.E.D.-III tools) derives 'RESP' or 'ESP' atomic charges and generates force field libraries for molecular fragment(s) or whole molecule(s) starting from a set of un-optimized PDB structures. It sequentially executes (i) the GAMESS-US, Firefly or Gaussian program to optimize the structure(s) studied and to compute the corresponding Molecular Electrostatic Potential(s) (MEP), and (ii) the RESP program to fit the atom-centered charges to the MEP previously determined. - RESP ESP charge DDataBase or R.E.DD.B. is a database that allows freely storing and distributing RESP or ESP charges and force field libraries for new molecules and molecular fragments in the scientific community. - RESP ESP charge Derive Server or R.E.D.S. is a web server, which executes the R.E.D.-IV program (version beta) to generate RESP and ESP charges and complex force field topology database for new molecules. - AmberFFC (presently version 1.3) automatically converts the AMBER and GLYCAM force fields in the Accelrys format. AmberFFC is intended to any modeler, who is interested in using the current AMBER and GLYCAM force fields within the Accelrys programs. - FFParamDev (still unavailable) computes bond, angle and torsion force field parameters. FFParmDev interfaces the GAMESS or Gaussian program to generate quantum mechanics energies (Eqm) and the "Sander" module of the AMBER package to get molecular mechanics energies (Emm). Then, it fits Emm values to Eqm ones, and determines force field parameters. E. Vanquelef, S. Simon, G. Marquant, E. Garcia, G. Klimerak, J. C. Delepine, P. Cieplak & F.-Y. Dupradeau, R.E.D. Server: a web service for deriving RESP and ESP charges and building force field libraries for new molecules and molecular fragments, Nucl. Acids Res. (Web server issue) 2011, 39, W511-W517, [PMID], [PMCID], [Local PDF file]. F.-Y. Dupradeau, A. Pigache, T. Zaffran, C. Savineau, R. Lelong, N. Grivel, D. Lelong, W. Rosanski & P. Cieplak, The R.E.D. tools: Advances in RESP and ESP charge derivation and force field library building, Phys. Chem. Chem. Phys. 2010, 12, 7821-7839, [PMID], [PMCID], [Local PDF file], One of the top ten most-read articles from the online version of PCCP for July 2010. P. Cieplak, F.-Y. Dupradeau, Y. Duan and J. Wang, Polarization effects in molecular mechanical force fields, J. Phys. : Condens. Matter, 2009, 21, 333102, [Abstract], [Local PDF file]. F.-Y. Dupradeau, C. Cézard, R. Lelong, E. Stanislawiak, J. Pecher, J. C. Delepine & P. Cieplak, R.E.DD.B. : A database for RESP and ESP atomic charges, and force field libraries, Nucl. Acids Res. (Database issue), 2008, 36, D360-D367, [PMID], [PMCID], [Local PDF file]. F.-Y. Dupradeau, S. Pissard, M. P. Coulhon, E. Cadet, K. Foulon, C. Fourcade, M. Goossens, D. A. Case & J. Rochette, An unusual compound heterozygosity in HFE Hemochromatosis (p.G43D-H63D/p.C282Y): Structural implications with respect to binding with transferrin receptor 1, Hum. Mutat., 2008, 29, 206, [PMID], [Local PDF file]. J. Chen, F.-Y. Dupradeau, D. A. Case, C. J. Turner & J. Stubbe, DNA oligonucleotides with A, T, G, or C opposite an abasic site: Structure and dynamics, Nucl. Acids Res., 2008, 36, 253-262, [PMID], [PMCID], [Local PDF file]. J. Chen, F.-Y. Dupradeau, D. A. Case, C. J. Turner & J. Stubbe, Nuclear Magnetic Resonance Structural Studies and Molecular Modeling of Duplex DNA Containing Normal and 4'-Oxidized Abasic Sites, Biochemistry, 2007, 46, 3096-3107, [PMID], [Local PDF file]. F.-Y. Dupradeau, D. A. Case, C. Yu, R. Jimenez & F. Romesberg, Differential Solvation and Tautomer Stability of a Model Base Pair within the Minor and Major Grooves of DNA, J. Am. Chem. Soc., 2005, 127, 15612-15617, [PMID], [Local PDF file]. C. Cézard, X. Trivelli, F. Aubry, F. Djedaini-Pilard & F.-Y. Dupradeau, Molecular dynamics studies of native and substituted cyclodextrins in different media: 1. Charge derivation and force field performances, Phys. Chem. Chem. Phys. 2011, 13, 15103-15121, [PMID], [Local PDF file]. S. Abel, F.-Y. 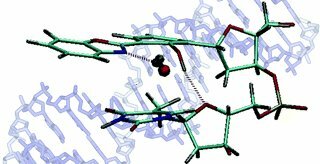 Dupradeau, R. E. Prabu, A. D. MacKerell & M. Massimo, Molecular simulations of Dodecyl-β-maltosidemicelles in water: Influence of the headgroup conformation and force field parameters, J. Phys. Chem. B. 2011, 115, 487-499, [PMID], [PMCID], [Local PDF file]. S. G. Gouin, J. M. Garcia Fernandez, E. Vanquelef, F.-Y. Dupradeau, E. Salomonsson, H. Leffler, F. Santoyo-Gonzalez, U. J. Nilsson & J. Kovensky, Multimeric lactoside "click clusters" as tools to investigate the effect of linker length in specific interactions with Peanut lectin, Galectin-1 and 3, ChemBioChem, 2010, 11, 1430-1442, [PMID], [Local PDF file]. Page visited times since January 6th, 2016. Last update of this page: January 6th, 2016.